Add a new main panel with a more appropriate number of breakers. Install appropriate size battery cables, and properly protect them. Replace lamp cord and non-marine wire with tinned and sealed marine cables. Add proper fuses to all devices. Remove all spaghetti and have all cables labeled when done. Have a good quality battery monitor. To this end I had quite a few decisions to make. The original CS panel, while visually pleasing, had extremely old wiring and uses spade connectors. It is also shy of the number of circuits I need to organize the loads on my boat. This means I need a new panel. After a lot of deliberation and measuring I decided that I will keep the main DC panel in the companion way. Yes, the companion way is an inherently wet location, and is not really where electronics ought to be. One particularly clever alternative is turning the wet locker into an electronics locker. I like the aesthetics of that location as well as the dryness, however, I think I want to retain that wet locker for life jacket and foul weather gear storage. Tight as it is, it works in the tiny cabin. Having made that decision, I now needed to find a main panel which was horizontally oriented and had at least 8 breakers. My choice was made fairly simple when the horizontal criteria was considered. In the end I have selected the Blue Sea Systems #8385 8 position panel. It's almost a perfect fit for the existing space and gives me two additional breakers over the factory panel. This will give me plenty of space to organize my circuits. I'll be consolidating quite a bit in the instruments and accessories cisruits using sub-panels which will free up what would otherwise be a lot of breakers. This was a fairly simple decision. I looked at a bunch of options, but yet again I was convinced by an excellent article on installing a battery monitor from MaineSail's collection. 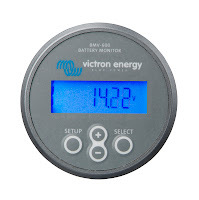 Ravat will be sporting a Victron Energy dual bank monitor so I can conveniently monitor both my house bank and starting bank. While I'm adding a number of additional breakers, I don't have unlimited space. With that in mind, I know I will need to consolidate components on circuits. To do this properly, I want to terminate each device in a block with a fuse. 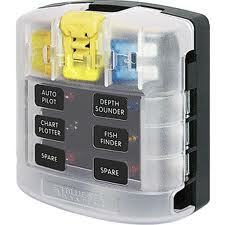 My first stop was Blue Sea Systems again, and my choice is the #5015 ST Fuse Block. I will be installing one of these for the instruments circuit, and another for the electronics circuit. Blue Sea makes two functionally similar units. One uses the glass tube fuses, the other uses the ST automotive fuses. I like the idea of the bladed automotive fuses, although I'm not sure why. After some reasearch I was unable to determine any pros or cons beyond personal preference between the two styles. As a result, I went with the ST block. The other decision I had to make here was whether or not I would purchase the model which has a ground terminal, or positive only. At the time I purchased all of the electrical components I had not fully laid out the locations where they would be mounted. As it's possible I may need to mount these blocks not necessarily in close proximity to the main ground bus, I thought it would be best for organization and intuitiveness if I was able to terminate each device's positive and negative wires in the same location. The existing battery cables were spindly little things that would no doubt explode in a fiery ball if allowed to stay on the boat. I was advised by many people to use at least a 2AWG cable to create the core DC pathways. While I certainly can't argue with that being a solid plan, I also couldn't quite justify the additional expense and hassle in routing the wires. I created a comprehensive electrical plan for the boat. in it I diagrammed each wire's conservative length and amperage. There was simply no place anywhere on the boat which could require a 2AWG cable even using the 3% voltage drop tables. So, since I couldn't find a reason to spend the extra money, I went with 4AWG cables. I believe the highest load comes from my starter motor, and thus far the boat starts up immediately, and with much greater enthusiasm than the old 10AWG wire which used to feed that starter. My original plan was to have GenuineDealz.com make my cables to length and terminal size. Their prices for this sort of thing are fantastic and I would be assured a professional installation. When it came time to put together the schedule for wire lengths and terminals I quickly realized that the documentation additional effort on my part was just not worth it. There is a significant variety of post sizes on my busses and components, and to make the wires lay properly, I was going to need very specific lengths, not just "safe" rough estimates. These realizations led me to purchase the FTZ crimper from GenuiineDealz.com. It's a lifetime tool to be certain. Built for industrial use, and works like a charm with the FTZ terminal assortment I also purchased. Having gone through this project now, I would say without hesitation that making my own cables was the right decision. In order to properly maintain the batteries, and ACR will be installed to eliminate the need to switch the battery selector to "all". If a charging voltage is present, it will charge the batteries.